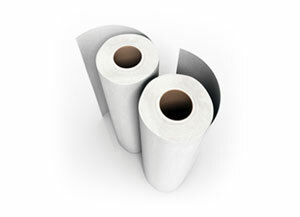 These papers are compatible with most solvent based inkjet printers. A bright white water-resistant canvas composed of 35% cotton with a 65% polyester blend giving it a uniform low glare finish. A bright white water-resistant canvas composed of 35% cotton with a 65% polyester blend giving it a uniform high sheen finish. A pearl metallic, water-resistant canvas composed of 35% cotton and 65% polyester. Luminous fluorescent metallic pigments are embedded in the glossy coating. This gives images an outstanding eye catching appearance and color definition.